Folder features dual pockets with snap shut front. Looking for convenient, colorful on-the-go Reusable Envelopes? Folder features dual pockets with snap shut front. Safely store and transport important papers and documents. Translucent polypropylene provides visibility while it protects. Great for leave-behinds and presentations. Two pocket folder with snap shut front. Two-tone transparent color. 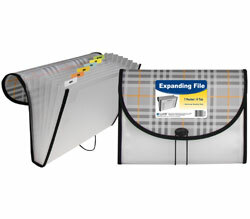 Holds up to 150, 8-1/2 x 11 documents. Assorted Tropic Tones colors include Seaside Blue (5/display), Seafoam Green (5/display), Sunset Red (5/display), Sandy Gray (5/display), and Sunny Yellow (4/display). Minimum order is 24 units (one display).